This past weekend, on Raymond Moriyama’s 85th birthday, the celebrated architect introduced the winner of the inaugural $100,000 prize established with hopes of elevating Canada’s — and the world’s — architectural aspirations. In a moving presentation to approximately 350 guests at the Aga Khan Museum, Moriyama explained how he dreamed of becoming an architect as a young child, and how building a treehouse when he was 12 – while living in a Canadian internment camp during World War II – gave him a sense of hope and connection with nature, and with humanity, when he needed it most. It is this sense of connection and humanity which Moriyama aims to celebrate with the new biennial architecture competition, which attracted entries from nine countries for its inaugural event. 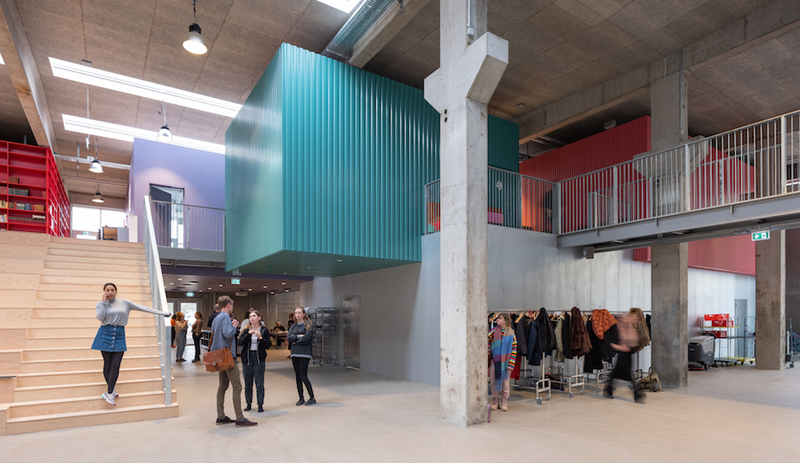 The Moriyama RAIC International Prize is intended to recognize projects which provide a transformative and inclusive influence on their community, while exemplifying excellence in design. Moriyama emphasized that the winning project must be currently in use and occupied for at least two years, to ensure that the design accomplishes its goals. 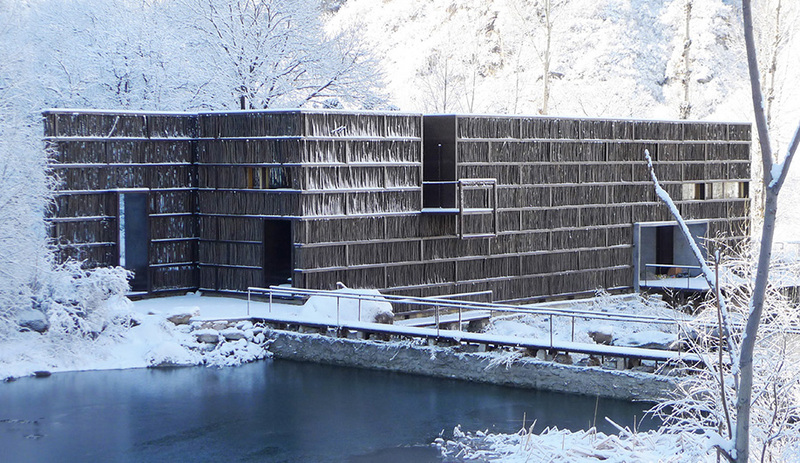 The winner, the Liyuan Library – located in a small village in China – was built as a pro-bono project by Li Xiaodong. Click here for a recent interview we did with Raymond Moriyama. And below is our original article on the winning project, featured in Azure‘s Mar/Apr 2012 issue. 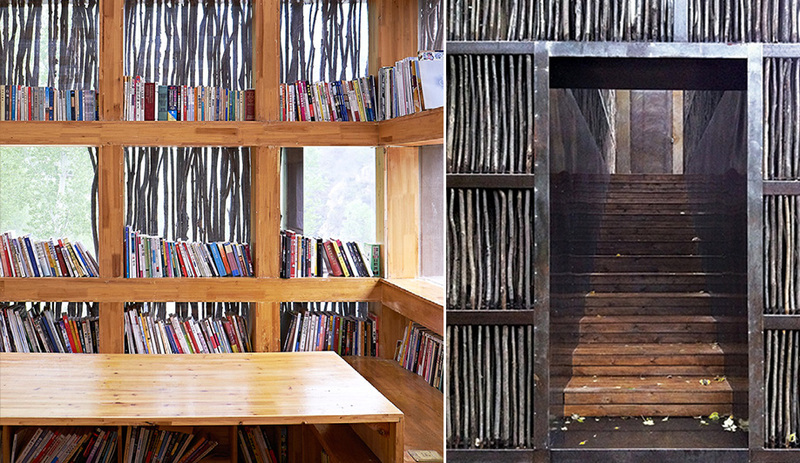 Li Xiaodong’s library, clad in 40,000 wooden sticks, gives a tiny village outside Beijing a stunning sanctuary devoted to reading. The Chinese village is, by all accounts, an endangered species. Three decades of economic growth anchored in the country’s swollen urban hives has sapped many rural settlements of young, able-bodied and entrepreneurial souls. Left behind are the witnesses to this exodus, mostly those too elderly to flee, and sometimes their grandchildren, who are merely biding their time before they can hitch a ride to anywhere else. At first glance, the village of Huairou, tucked into a valley below the meandering stones of the Great Wall, looks like just another forgotten outpost. When I visited on a freezing December afternoon, the only evidence of life was a pair of shaggy guard dogs and a woman, cheeks red with windburn, waiting for me with a pair of keys. We drove through narrow lanes and past squat brick houses; the tinny squawk of propaganda blaring from loudspeakers mounted on lampposts making the only sound, save for the wind. 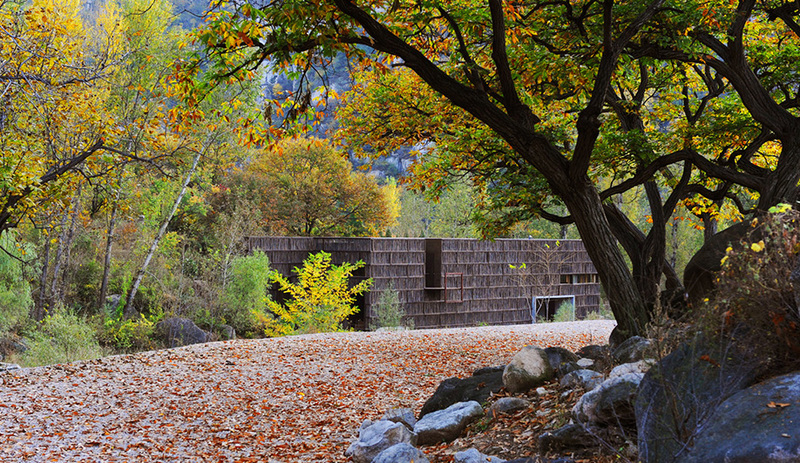 Yet as we turned a corner, the dirt road became a layer of white pebbles that wound toward a long rectangular structure, sheathed in branches that almost camouflaged it amid the barren winter landscape: the Liyuan Library. Designed and built by Beijing architect Li Xiaodong, the two-storey, 175-square-metre centre represents the culmination of Huairou’s surprising resurrection from ghost town to bustling weekend refuge for Beijingers seeking a respite from smog and traffic and lured by its pastoral benefits. That is how Li discovered Huairou, which is two hours from central Beijing by car. 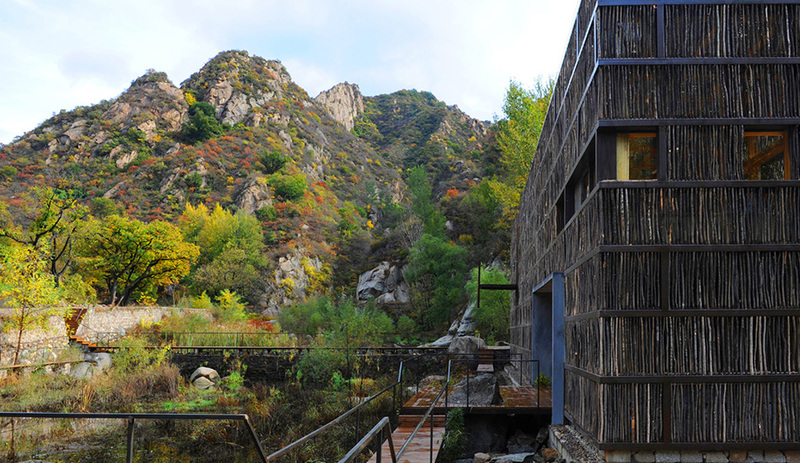 A professor of architecture at China’s prestigious Tsinghua University, he was struck by the villagers’ close ties to the seasonal rhythms of nature and how natural textures define their constructed world, particularly the ritual of gathering sticks from the surrounding hills; they tie them in bundles for firewood, stored outside their homes. When he received a grant from a Hong Kong fund to do any kind of project, as long as it was in the Chinese countryside, Li immediately decided on Huairou. 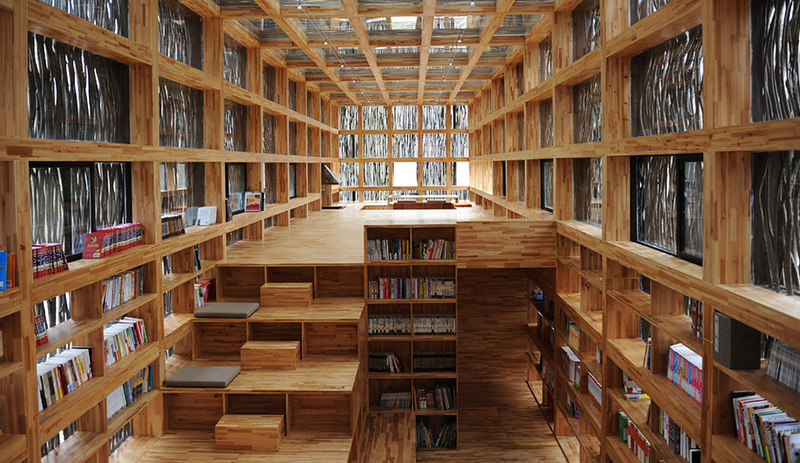 “I was thinking of building a school, but Huairou has no children, so I thought a library would function best for both tourists and villagers,” he says. Li found the site in November 2010 and finished the design in February 2011. Construction began the next month and was completed in October. 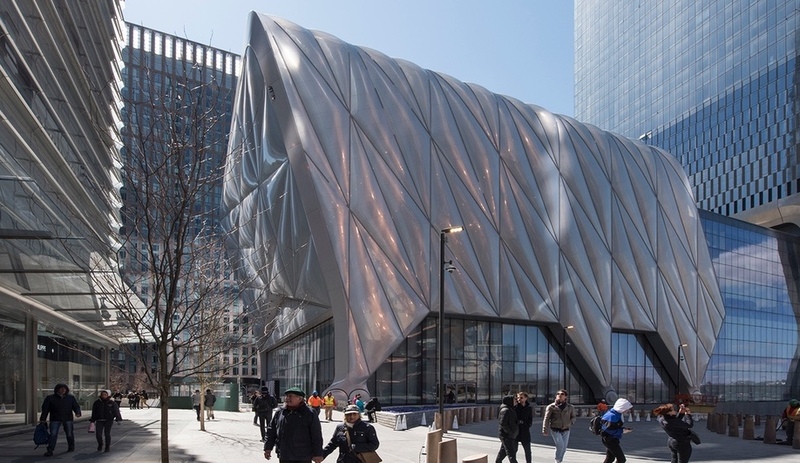 The steel frame building is completely glazed and clad in eight rows of 40,000 sticks that can easily be replaced, and are easier still for birds to nest in. 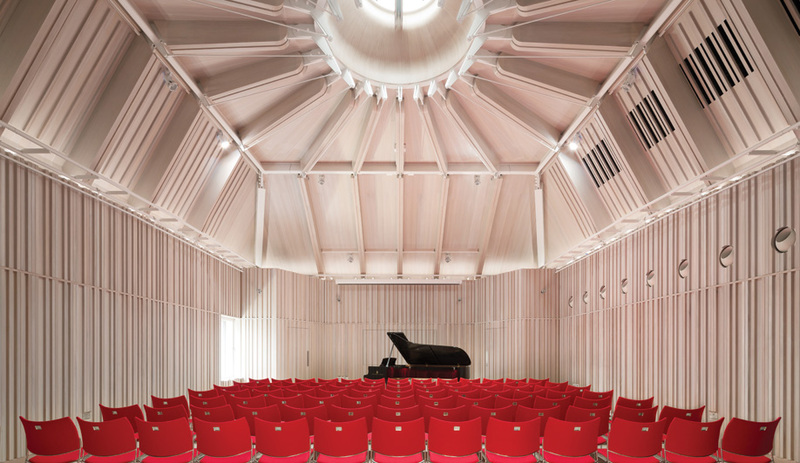 To reach the library, visitors traverse a wooden boardwalk over a babbling stream and enter through a steel door on the ground floor, or continue to the back, where they ascend a flight of stairs to emerge on a small balcony overlooking a dramatic vista. 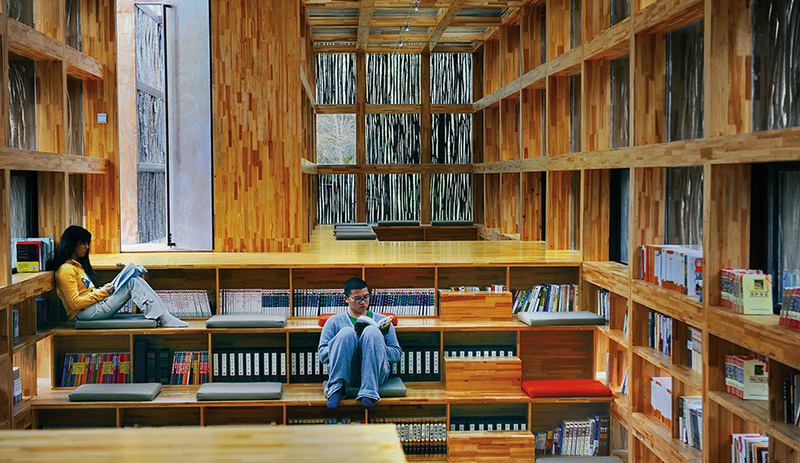 From the ground floor, they climb a short flight of stairs and find themselves in a sanctuary made of pine, where nearly every surface has multiple functions: stairs are seats and bookshelves; window ledges hold more books – over 7,000 titles, all donated. 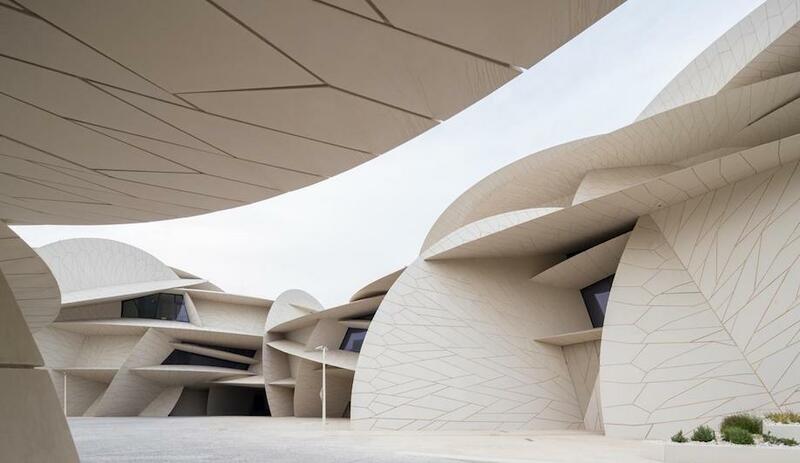 The exterior branch cladding on all sides, including the roof, gives the impression that one is embraced by light, always bright but not glaring. This ambient aura lets visitors see the pages in their hands as well as the world around them.